Information visualization is essential in making sense out of large data sets. Often, high-dimensional data are visualized as a collection of points in 2-dimensional space through dimensionality reduction techniques. However, these traditional methods often do not capture well the underlying structural information, clustering, and neighborhoods. In this paper, we describe GMap: a practical tool for visualizing relational data with geographic-like maps. 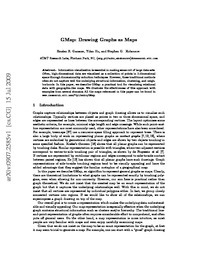 We illustrate the effectiveness of this approach with examples from several domains All the maps referenced in this paper can be found in www.research.att.com/~yifanhu/GMap.